← After Bold Step on Syria, French Leader Finds Himself Dismissed as Lackey…but he isn’t a poodle yet! For a moment, let’s forget the central debate of our political period — how much of a role government should play in our lives — and ask a different question: can government policies counteract inequality in any meaningful way? Four political scientists – Adam Bonica of Stanford, Nolan McCarty of Princeton, Keith T. Poole of the University of Georgia and Howard Rosenthal of New York University – take this issue head on in their paper, “Why Hasn’t Democracy Slowed Rising Inequality?” published earlier this year in Journal of Economic Perspectives. Bonica, McCarty, Poole and Rosenthal argue that politics can be an effective tool to restore economic fairness — that government can, and should, correct imbalances the market produces, providing for those who cannot compete, ensuring opportunity for those who can and blocking those who would appropriate to themselves what the authors see as an excessive share of our national prosperity. “Immigration and low turnout of the poor have combined to make the distribution of voters more weighted to high incomes than is the distribution of households. 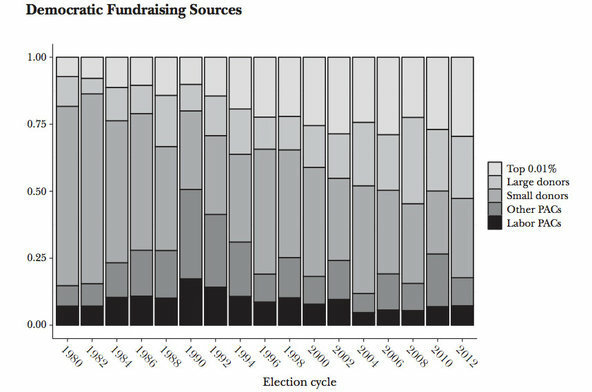 Turnout, of course, can also be influenced by legal and administrative measures that make it relatively costly for the poor to vote. The authors produce a number of graphics to support their claims. 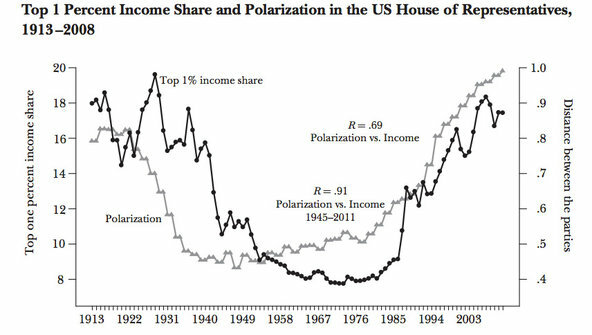 Figure 1 shows a positive correlation between the share of income going to the top 1 percent and the level of polarization between the two political parties in the House of Representatives. In the interest of promoting debate, I ran the questions raised by the Bonica paper — “do democracies have the capacity to remediate massive increases in economic inequality” — by a number of experts, including Isabel Sawhill and Gary Burtless of the Brookings Institution; Andrew Fieldhouse and Benjamin Landy, policy analysts at the Century Foundation; Sean Reardon, a professor of education and sociology at Stanford; Austin Nichols of the Urban Institute; Daron Acemoglu, an economist at M.I.T. ; and Leslie McCall, a sociologist at Northwestern. To what degree is growing inequality a result of political decisions or of economic and demographic trends? oversell the relation between public policy and income inequality – the political sphere influences the playing rules for the free market, but U.S. income inequality growth is, at the core, being driven by very strong market forces for much longer than U.S. income inequality has been in the public discourse. With the technological changes and the more globalized economy we live in, the cost of stemming the rise in inequality has also increased. A cross-country perspective shows this very clearly. Several European countries, including Germany and Sweden, which have well-functioning democracies and strong social democratic parties, have also reformed their labor market and product market institutions, leading to greater inequality over the last two decades. A cross-country perspective also indicates that the factors the paper mentions can at most be a portion of the puzzle. Globalization and changes in technology have been a boon to owners of capital, allowing them to decrease their labor costs, boost productivity and, in many cases, replace workers’ jobs entirely. Would raising marginal tax rates significantly lessen inequality? I found no consensus on this. tax, transfer, and regulatory policy can and should push in the right direction, but it would take large political forces to keep from exacerbating inequality; halting let alone reversing market-based inequality growth of the past three decades would require policy actions beyond the conceivably viable. Fieldhouse notes that politically untenable policies include the adoption of full-employment monetary and fiscal policies — in other words, a massive jobs program requiring a large expenditure of tax dollars is not in the offing. In contrast, Nichols of the Urban Institute makes the case that Bonica and his colleagues underestimate “the central importance of taxes” in fueling inequality — because they fail to recognize how much cuts in capital gains rates over the past 25 years have enhanced the wealth of the top 1 percent and especially the top 0.1 percent. Intellectual capture of political elites and the political and financial power of the affluent. the split within the Democratic Party in the late 1960s between “traditional,” blue-collar Democrats and the more radicalized New Left. The Democratic Party’s newfound focus on women’s rights, gay rights and affirmative action alienated a substantial number of older, white liberals. The modern-day coalition of social conservatives and the business community would not be as strong as it is without that schism, which allowed the Republican Party to breed resentment by racializing what were formerly working-class economic issues. Lack of confidence in the government. Bivens and Mishel define “rent” as income “in excess of what was needed to induce the person to supply labor and capital,” and they assert that much of the income of the top 1 percent has little to do with productive economic activity and could be taxed away without harm to the economy. Others writing in the same issue of the journal believe that taxing or otherwise limiting the wealth of the very rich can harm productivity. My own reading of the evidence is that most of the very wealthy get that way by making substantial economic contributions, not by gaming the system or taking advantage of some market failure or the political process. One explanation that has been proposed for rising inequality is that technical change allows highly talented individuals, or “superstars,” to manage or perform on a larger scale, applying their talent to greater pools of resources and reaching larger numbers of people, thus becoming more productive and higher paid. Malcolm Gladwell’s explanation for inequality in “Outliers: The Story of Success” bridges, to some extent, the arguments of left and right. He makes the case that it is hard work – famously, 10,000 hours of hard work – that leads people to gain abilities that then result in the acquisition of disproportionate resources. Gladwell notices, however, that a remarkable degree of good luck is needed to realize the gains from even well-honed skills. Superstar lawyers and math whizzes and software entrepreneurs appear at first blush to lie outside ordinary experience. But they don’t. They are products of history and community, of opportunity and legacy. Their success is not exceptional or mysterious. It is grounded in a web of advantages and inheritances, some deserved, some not, some earned, some just plain lucky – but all critical to making them who they are. This entry was posted in Civil Society, Corporate-Congressional Complex, Democrats: The Good, the Bad, and the Ugly, Economics 101, Fascist America, Media: Corporate and Controlled. Bookmark the permalink.